The common grackle, or Quiscalus quiscula, is found pretty much in all of the US east of the Rocky Mountains. It is a very common bird. It is an irridescent blue-black in color with black legs and a shiny yellow eye. Grackles are extremely smart. Grackles make an interesting song. It sounds like a rusty gate swinging back and forth, sort of squeaky. Many birders are less than fond of the grackle because he can scare away smaller birds and then eat all of the food put out in one big gulp. 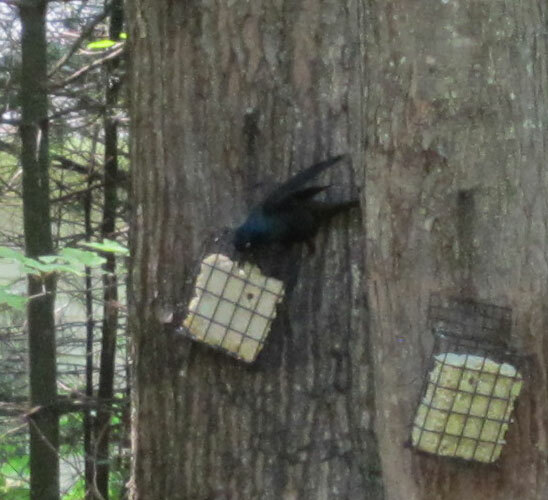 They eat sunflower seed and suet and just about anything else you can put out. 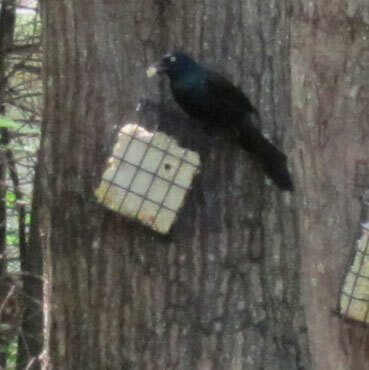 I enjoy the shiny colors of the grackle and just make sure to put out enough food for everyone. The grackle can serve as a good early warning system in case your neighbors allow their cats to roam free.